Brosamer's Bells buys and sells many types of large vintage bells. 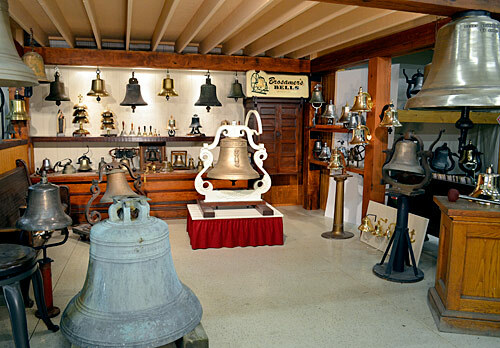 Our expertise is in large pre-owned Bronze and Cast Iron bells. We ship world wide. Please note we are not a foundry; we do not cast new bells. We have over 30 years of expertize and our customers include Churches, schools, resorts, estates, motion pictures and theme parks, celebrity homes, golf courses and parks, businesses large and small, sports teams, railroad enthusiasts, ship owners and fire departments. Please browse our web site for your Bell needs. Our inventory can change daily don't hesitate to e-mail us if you are looking for something special. We will be happy to work with you, an architect or a committee. We also carry a line of SMALL new bells: Memorial Bells. Brass teacher hand bells, salesroom, and bar bells. Check the individual web pages. We also buy bells, see our "We Buy Bells" page. We also do Appraisals, click there for Appraisals Guidelines. If you have questions on a bell you have found, the only service we offer is on The Appraisals Page. Whenever you see this icon: you can click on it to hear the sound of a bell. These sounds are somewhat large in filesize, so you may have to wait for them to download if you have a slow connection. The sounds have also been shortened to minimize download time - some of the larger bells resound for quite some time.